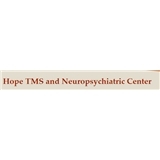 Hope TMS and Neuropsychiatric Center (New York) - Book Appointment Online! Once I got into see Dr. Ruiz (it's a very small office with only 1 receptionist), he was very understanding and compassionate about my issue. He took plenty of notes, and I'll be seeing him again in another 4 weeks.